Giannini’s history of passion, creativity and experience is completely unique in the Roman and Italian automotive archipelago. It is at the basis of an industrial and racing dynasty a hundred years in the making. The seeds for the 1920 opening of the first Giannini automobile workshop in Vicolo della Fontana, Rome, were sowed in 1917 by brothers Attilio and Domenico in their hometown of Amadola (small town in the province of Ascoli Piceno, Marche). The small firm earned their clients’ trust in a few short years, with their reputation growing with time, as shown by Itala choosing them as their affiliated workshop in Rome. As aficionados of racing, it was not too long before the two brothers undertook sportive and racing engine tuning- they were first known for their elaboration of Marchese Pellegrini’s Itala Tipo 61, which had good results in various competitions, including the 1927 Mille Miglia. They followed these successes by tuning Checco Matrullo’s Salmson 1100, Lello Cecchini’s MG Midget (winner of its division championship in 1934) and Remo Venturi’s Idrocorsa. In 1936, the emergence of FIAT’s 500 Topolino gave Giannini the opportunity to develop its tuning activity on a larger scale, doubling the Topolino’s original engine power. The aerodynamic Topolino made for famous pilot Renato Donati in 1938 is just one of the 500s tuned for racing in the late thirties, characterized by particular cylinder heads and increased engine volume. Also, a record breaking 12 time winner of its division’s world championship 500 one-seater with average top speed of 151,27 km/h was prepared for Cecchini in the same year. Meanwhile, the Giannini brothers experimented an engine with three main bearings, a wielded third bearing, steel crankshaft and ergal rods, with 40 HP at 6000rpm. Famous Engineer and creative mind behind CNA aeronautical engines, Carlo Gianini acted as advisor to the project. His past experiences included the OPRA 500 motorcycle, in collaboration with his colleague Pietro Remor, and the legendary Rondine 500 and Moto Guzzi 500 grand prix motorcycles. Following this new engine, he would then design the famous G1 750 single shaft and G2 750 double shaft engines, in addition to the 700 4C boxer and the single shaft 1000 MT, all of which were made especially for racing. At the end of the forties, the Gianninis acquired a vast property in Via Cave di Pietralata, a subsidiary road of Via Tiburtina neighbouring the train station. There, they set up their new workshop, now equipped for the treatment of vehicles from the military and heavier vehicles. The end of the war allowed the reorganization of racing championships where a Giannini two seater, driven by Sesto Leonardi, won the 1947 Campionato Italiano Sport 750. The reconstruction period brought many different opportunities to Attilio and Domenico. First of all, they decided to follow Giuseppe Sola’s project for the diesel 3A engine with three-cylinder fractioning, direct injection, balance shaft and patented combustion chamber. Aimed mainly to the repurposing of war-time residuals, the arrival of the Perkins engine would shorten the 3A’s lifetime significantly. The brothers also started the development of a FIAT 1400 gasoil transformation, which would then be blocked by the presentation of the 1400 diesel. As the economy boomed, Italian racing bloomed once again, leading to the birth of the G1 750 engine, which would become an absolute landmark of the sport; a must-have for constructors and pilots such as Baravelli, Cecchini, Dagrada, De Sanctis, Leonardi, Patriarca, Raffaelli, Taraschi, Tinazzo, Zannini. With its single shaft, axles and rockers with third fusion support, 45 HP (51-52 HP in its final evolution), the G1 750 would stand as the base of a recurring technical and commercial collaboration between the Gianninis and Taraschi, noted constructor from Teramo, known for his Urania-BMW 750. This would lead to the formation of Giaur (Giannini-Urania), trademark under which Taraschi would design a victorious series of sport, racing and record-breaking cars with Giannini engines. In 1953 Attilio and Domenico achieve a technical exploit which would place them in the Olympus of racing engine technicians. Under more and more commercial pressure after the successes of the G1, they released the G2 750, two-shaft drop-down, made completely out of light alloys, with five main bearings, ergal rods and Dell’Orto SS 28 carburettor. Very similar to the 1953 4-cylinder Moto Guzzi 500 GP, the G2 was greatly celebrated thanks to its incorporation in engineer Giulio Carcano’s fabulous 500 8V. Released with 60 HP at 7200 rpm, the G2 soon became a point of reference for its category. Its power would then grow to 70 HP, eventually reaching 112 HP in its evolution to 996 cm3 used on Elio Pandolfo’s Brabham F2 and Cesare Toppetti and Massimo Natili’s Lotus 23s. The G2 was also used in the original Bisiluro Nardi for the 1955 Le Mans 24 hours and the futuristic and supercharged Giaur 750 driven by recordman Jean Grousset. 25 people were employed at Giannini in Via Cave di Pietralata by 1955. Helped by the release of the FIAT 600, Attilio and Domenico opened a bigger Giannini Automobili Spa dealership in Viale Liegi, activity which for a variety of contingent reasons would not last long. In 1957, determined to follow this track, Franco Giannini opened a showroom in Via Tiburtina, selling custom cars (Moretti, Scioneri, Viotti etc.) and cars tuned by Giannini (especially FIAT 500s, 600s and 1100, along with Alfa Romeo Giuliettas). Disagreements following the downfall of this second commercial adventure would lead to the end of Attilio and Domenico’s partnership, and the sale of the establishment in Via Cave di Pietralata. Domenico and his son Franco would establish Giannini Automobili Spa in Rome, while Attilio, Tonino and Ruggero, along with Claudio Tani, would start Costruzioni Meccaniche Giannini SpA in Settecamini. 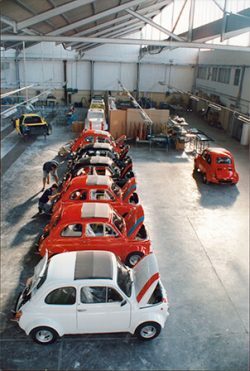 The former would diverge into producing and commercializing tuned FIATs, while the latter would maintain the status of workshop, much like in Via Cave di Pietralata. A wider audience of Italians would come to know of Domenico and Franco’s Giannini Automobili SpA, direct predecessor of the current Giannini firm. Now situated in the former showroom in Via Tiburtina, Giannini Automobili SpA would follow Carlo Abarth’s fortunate business model, tuning various FIATs. Just like their scorpion-crested counterparts, they would centre their production around the new 500, 600 and 850 (including racing derivates and custom cars), along with working with the much bigger 1300, 1500 and 124. Because of their lower price and equal quality in comparison to Abarth, Giannini would encounter great success very early on. The 500 TV Montecarlo and 590 GT Vallelunga would pair great sales with amazing racing results. Having obtained the FIA Group 2 certification (1000 units), the roman two-cylinders would become and remained, for years, absolute protagonists of the Italian racing panorama, on track and uphill. Costruzioni Meccaniche Giannini SpA would achieve some success of its own, working on tuning for its sister company, preparation of racing engines (CMG’s double shaft G2 with 996 cm3 would win Toppetti and Natili three Campionato Italiano Sports), prototypes, dune-buggies and special vehicles. The 700 4C (a four cylinder boxer developed from the 500 Giardiniera engine), the 1000 MT (single shafted with hemispherical combustion chambers and patented mechanical injections) and the awesome 8V 1600 (entirely designed, molten, prepared and assembled by CMG) with 170 HP at 8500 rpm are just some of the prototyped engines produced by CMG in those years. Attilio’s passing in the summer of 1969 would lead to economic and administrative issues which would cause the closing of the firm shortly after. Giannini Automobili SpA would encounter its own struggles, followed by the entry of a new main shareholder, Gian Luigi Natali, entrepreneur previously known for his presence in the sector of sanitary supplies. He would assign the arduous task of restoring the company’s health to the “avvocato” Volfango Polverelli- a choice which would prove to be fundamental for the future of the firm. Polverelli was initially hesitant, preoccupied by his commitments as a lawyer, entrepreneur (managing a considerable estate in Emilia), politician (Polverelli was mayor of Alseno, a small town close to Piacenza) and family-man (being married with five sons). His attraction to the automotive world and a knack for hard challenges, on the other hand, led to his agreement to Natali’s offer. Polverelli would go on to cure the ails of Giannini Automobili and become single shareholder of the company in 1973. Franco Giannini, bought out of his shares, relocated to Turin where he founded OTAS – Officina Trasformazioni Auto Sportive, which would close after two years. Having settled all economic matters, Polverelli started a program of initiatives in order to elevate Giannini Automobili SpA to a considerable industrial dimension. In particular, a production headquarters in Via Teano and directed by Claudio Tani allowed Polverelli to keep Via Tiburtina exclusively for expositive and commercial functions. Giannini added more models to its repertoire, 650 NP and NP Modena; 1000 Berlina, Coupé and Spider editions; 128 NP and NP S; 127 NP and NP S; 132 2000 (which preceded the FIAT 132 with 2 litre engine by about two years). The Sirio 650 and 128 Sport concepts were also worth mentioning, designed by Adolfo Melchionda. The 650 NP also obtained Group 2 certification, immediately becoming a star of its class. Giannini’s racing reputation was further augmented with 128 NP being certified to Group 2 status in 1972, confirming the essential role of racing in the company’s history. When the curtain called, Giannini’s “bicilindriche” had brought home 23 national titles. Volfango Polverelli’s input was strengthened once more by the construction of the current plant in Via Idrovore della Magliana, in the outskirts of Rome’s EUR neighbourhood: an imposing and modern complex spanning 26000 square metres, 6000 of which are sheltered. Times were not easy, as the 70s were characterized by a recession after the 60s’ boom, and this further highlights Polverelli’s determination and entrepreneurial dedication to the company. The land was in fact bought in the midst of the Kippur War, construction was undertaken while Italy encountered its first major post-war economic crisis (in 1974, GDP decreased by 10%), and the complex was inaugurated as Italian automotive sales fell to their post-war minimum. Helped by his sons Gaetano, Giacomo and Gabriele, Volfango organized the new plant in a rational and flexible manner, pairing independent production of Giannini cars with the revision of numerically large car fleets such as those of Law Enforcement, Public Administration, Post Offices etc. More and more models were added to the catalogue: 500 TV R and GT R; 126 GP, GPS and GPA, X 1/9 Special; 350 EC (a version of the 500 R with 390 cm3, more adequate for the harsh oil prices of the time); Nuova 127 NP and NP S; Nuova 128 NP and NP S. The commercialization of the Ritmo Diesel inspired the design of a new turbo version, preceding FIAT’s equivalent by 4 years. Studied by engineer Armando Palanca, the Giannini Ritmo Turbodiesel adopted a Japanese IHI turbine and rached 78.5 HP. The tuning of Panda 30 and 45 also gave very interesting results. Meanwhile, Giannini also participated at the Endurance World Championship with the Giannini Carma FF 1,8/1,9 Turbo engine being used on the Alba-Giannini Carma AR2 and AR6 in Group C. Both two-seaters were designed by engineer Giorgio Stirano and driven especially by Carlo Facetti and Martino Finotto in addition to Fulvio Ballabio, Almo Coppelli, Guido Daccò and others. The Alba-Giannini Carma AR2 would go on to win the C2 Junior Endurance World Championship of 1983. At the start of the 1980s, the changing Italian automotive market lowered the appeal of tuned models, shifting Giannini’s production towards the customization of private vehicles. Tuned vehicles remained catalogued until 1987, led by the incredible Uno Turbo with a 78 HP 903 cm3 engine, again designed by Palanca. Volfango Polverelli’s passing in 1984 lead to a deeper involvement of his sons in the company, with Gabriele Polverelli taking on commercial and administrative functions, Giacomo working on research and development, and Gaetano managing production as CEO. Giannini undertook its new route by taking part in the new special Gruppo Carrozzieri, in 1988 after having participated in the Gruppo Costruttori Vetture Speciali since 1952, alongside Cistalia, Moretti, Nardi, Siata and Stanguellini. 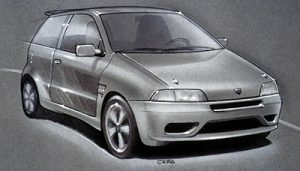 The 90s bring new initiatives such as the development of the 590 Corsa Replica, the 500 Sportline, the Uno Turbo i.e. and the Tipo Twentyfive. 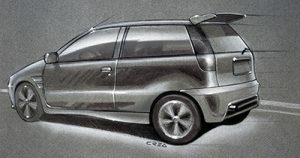 The firm also embarked in more conceptual design adventures, with the stylistically and technically innovative Uno Torino ES, Punto TL 4×4 and Bravo Windsurf (all designed by Nicola Crea), and the 600 GTO (designed by Maurizio Ficcadenti). The independent production of automobiles would then be stopped because of stricter certification rules and a decreasing market appeal. Giannini is now reorganized to play an important role in the service sector for FIAT Group, with a particular dedication to ministerial vehicles (including bulletproof cars), cars from the Public Administration and the Group’s press department. The premature deaths of Gaetano Polverelli in 2011 and his brother Gabriele in 2016 have led to an even deeper involvement of the Polverelli family into the management of affairs at Giannini, determined to maintain and develop this historic firm in Italy’s rich automotive sector.